Singing is one of those things that every human can do, but many avoid doing because they think they’re not good at it or that they have bad voices. There is no such thing as a bad voice. There are voices that people prefer to hear, but breaking things down in to good and bad–especially when you’re working with children–doesn’t do anyone any good. Now I judge the heck out of singers. When people tell me I should audition for America’s X Factor Yodel Idol, or some other such nonsense, I want to cry. Those people aren’t singers. I don’t know what they’re doing–hollering slightly out of time, maybe, or gyrating while they emit sound waves–but that, to me, is not singing. And there’s definitely a difference between singing on a stage, for people who might have paid to hear you sing, and singing because it feels good and it makes you happy. Ideally those singers on stage are happy when they sing, but not always. But anyway. Singing in storytime is amazing. Singing and music can bring people together in a way unlike any other art. We know, anecdotally, that rhythm soothes and teaches—that’s why we sing nursery rhymes, and rub our baby’s back when she’s trying to fall asleep. That’s why dancing is so revitalizing for many–the rhythm does, indeed, get you. That’s why massage–the rhythmic stroking of our body–is so soothing. Science is also looking into whether or not music and rhythm can actually be used as medicine. I know that if I am having a bad day, or am stressed out, banging out some c&w rhythms on my guitar can have a positive effect on my mood. 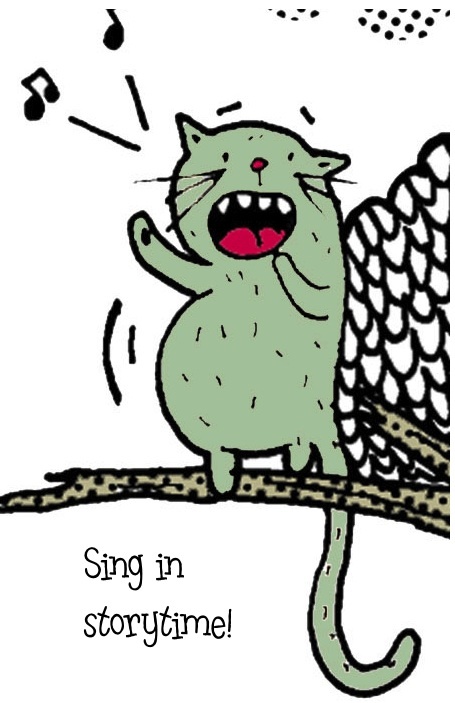 Even without all that, singing is one of Every Child Ready to Read’s 5 skills. So there’s every reason for librarians to be singing in storytime, and programs beyond storytime as well (seriously, I played a Bob Dylan song for a group of 7th graders once and it was amazing). “But I can’t sing!” you cry. Yes, you can, I reply. If you can talk, you can sing. Listen. Kids don’t care. They are the perfect audience to sing to. They don’t notice if you’re pitchy, or off key. They love the sound, the rhythm, the melody, the movement. If you’re smiling and excited as you’re singing, they will love you. You will be a rock star in the eyes of toddlers. Well, perhaps. I’m accustomed to singing, and I enjoy it. But listen– singing with kids isn’t the same as playing a set of original weepy folk songs at the coffeeshop. Firstly, I put everything in a higher key for the kids, so their piping voices can sing along more easily. I’m singing slightly above my range in every storytime, and most times my voice will inevitably break a la Peter Brady. And no one cares. The adults will snicker if I reference Peter Brady, but no one is shocked that it happened. In fact, it sets everyone at ease and gets more people singing. I also play guitar. Which kids like. But you know, playing basic folk guitar is not that hard. If you want to be Eric Clapton, that’s another thing. But if you want to play three chords and sing “The Wheels on The Bus”, well, that’s within everyone’s reach. And even then, kids don’t care. One time a kid completely undid the tuning on my guitar and I wasn’t able to fix it, but I played “Five Little Monkeys Jumping on the Bed” anyway, and not a single kid noticed. They just jumped their little hearts out. Some of the parents grimaced, but, well, that’s the cost of entertaining children–sometimes you annoy the adults. So sing in storytime! It will only bring you good things, I promise you. If you’ve written about singing in storytime, please link in the comments and I will add it to the list! I LOVE to sing during story time, and looking back on my past blog posts, I love writing about singing in story time (I just went back and looked at my blog posts from this past fall, and nearly every post from late August through early October was about singing and signing!) Here is the post where I cover the rundown of the tunes that fit to the “singable” books I’ve written: http://www.dawnprochovnic.com/2012/10/sing-me-story-more-quick-ideas-for.html. If you ever sing one of these at one of your own story times, I’d love for you to have someone capture it on film (I’m on a quest to get video footage of my singable signing stories being sung…oh, how’s that for a tongue twister? ).